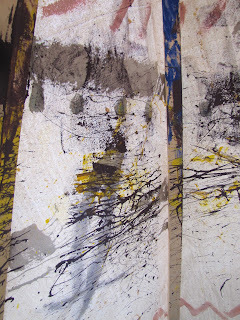 Factory 506: Action in the TeePee Department! Look was has been happening around here!!!! 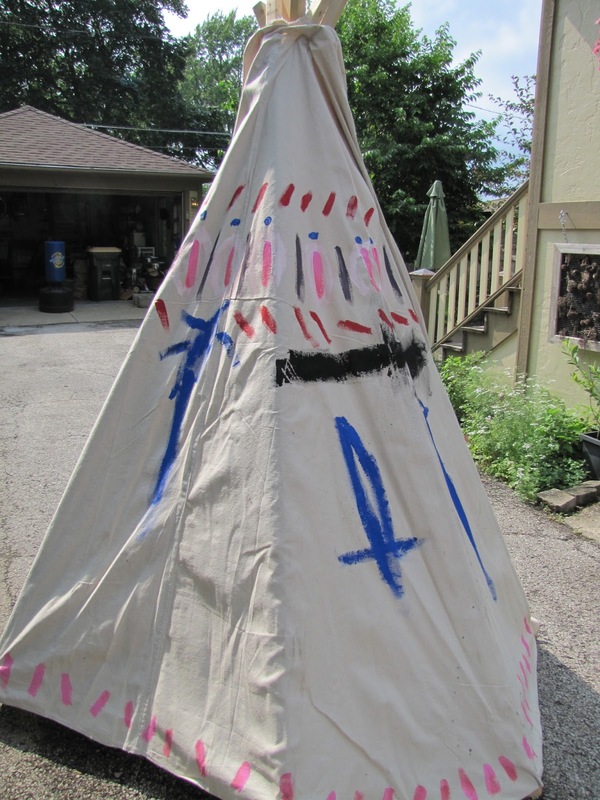 This is my friend's teepee, it is awesome! 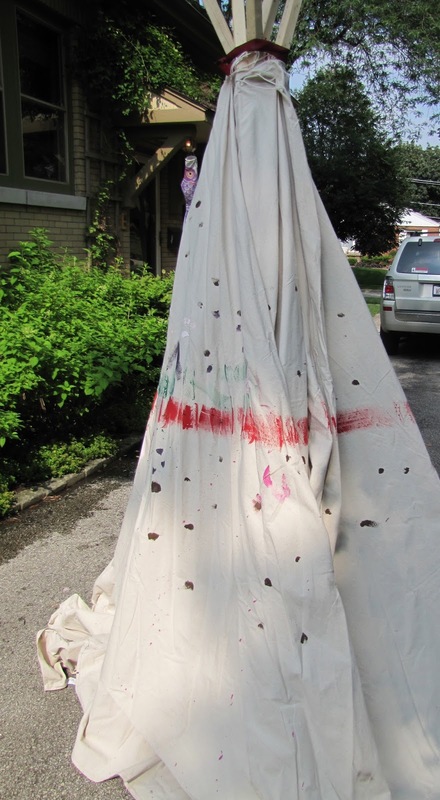 She and the draping wizard worked some serious magic with that drop cloth and it looks so beautiful. Here is my teepee. First, the draping wizard went home (ah-hem) and I didn't have the patience for the draping. So I picked up a scissor and then a staple gun... and this happened! Perfect for me and my impatient tendencies. At this point, someone went on vacation (not me!) and steam was lost on this project!!! Then, when everyone was back in town and kids schedules were aligned, it rained...like everyday at the time we planned to paint the teepees. We thought mother nature was against us, but then we realized that someone might have been doing a rain dance in their basement. We corrected that, and so the rain stopped, the sun came out and the humidity skyrocketed...it was teepee painting time!!! Two teepees, two moms, three children petite Picassos, a boat load of paint, about 50 paintbrushes, what felt like 500 paper plate palettes and some wine and we were ready to go! It was seriously so much fun. The teepees look awesome, the children had fun, lots of paint got used up (on the teepees and the children) and the teepees finally got painted!!! My son was on a roll with the big symbols (cave drawings?) on our teepee. This is my friends teepee in the early stages. The picture really does not do it justice. She has the drop cloth draped so beautifully. 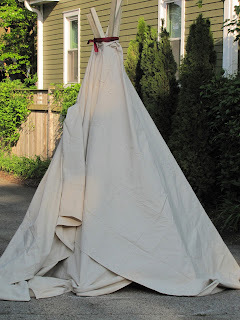 I will get more pictures of her teepee so that you can see the draping and the painting better. Moving right along with the paint! The inside of our teepee got Jackson Pollacked!!! We still have some finishing touches to do with the paint, and then we are going to accessorize them. Feathers are being painted, ropes are being wrapped and pompoms are in production! Once they are completely dolled up, I will post more pictures! 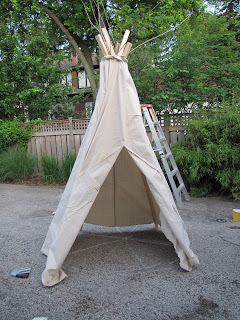 What do you think about making a teepee? Would you do it? Those are some seriously gorgeous Teepees! :) We do good work Lissa!! !